I can’t imagine what that is….a swarm of something? But I can definitely see half of a very evil face in there! In the smaller version I see a skydiver with a parachute. In the enlarged version I see a helmet shape or a large plastic bag blowing through the skies. Where did you capture it? Those are so creative! I was at home, but I saw it while in transit. Really? That is another new one! Part of a skull. Scary. Or a spider and web….equally scary. I can see a spider – head down? But how did it get in the sky with no web to be seen? Flying spiders!!! A gluey fingerprint on a window. Dementor? Of course, I was watching Harry Potter movies most of the weekend…. I have no clue, but I confess I don’t see and evil face. No? That’s what I see! Not quite a human one, thiugh – one eye socket is all runny or broken, and it looks like it has tentacles instead of teeth. That’s so freaky! It looks like a steampunk airship to me. Or a giant, poorly camouflaged web in the sky haha! Good one! I like the steamship idea! No! Do you see a face? Or anything else? I could if I looked hard. Did you ever figure out what it was? I knew what it was the whole time – you will laugh! I’ll tell soon. Hahahah! Oh I wish I could draw that! I think this has been my most fun post ever. Hahah! Oh man this is an old one. 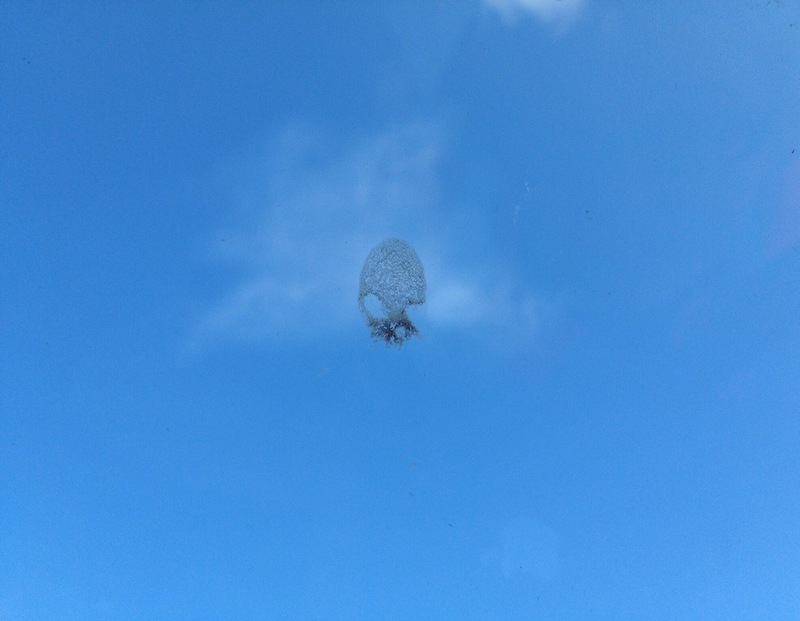 It was a bird poop! Mystery solved…I can rest in peace now.